I haven’t done a print and play game in quite some time. It usually requires a fair amount of time and if you want to do a good job it’s not necessarily inexpensive so it usually requires a great deal of interest on my part to get me going on a project. 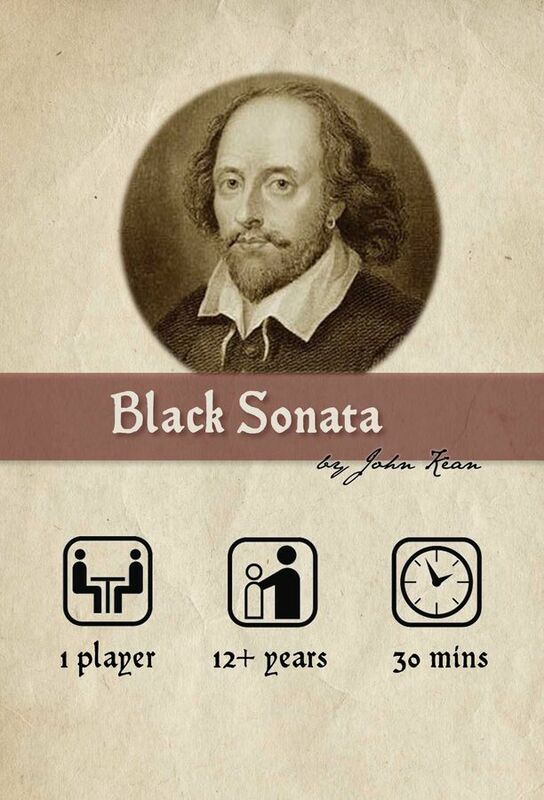 I was randomly perusing BGG and came across Black Sonata. The theme focuses on the search for Shakespeare’s “Dark Lady” the mysterious muse for some of his sonnets. Shakespeare theme? Check! Deduction? Check! It’s a solo game but it sounded interesting enough to hook me. 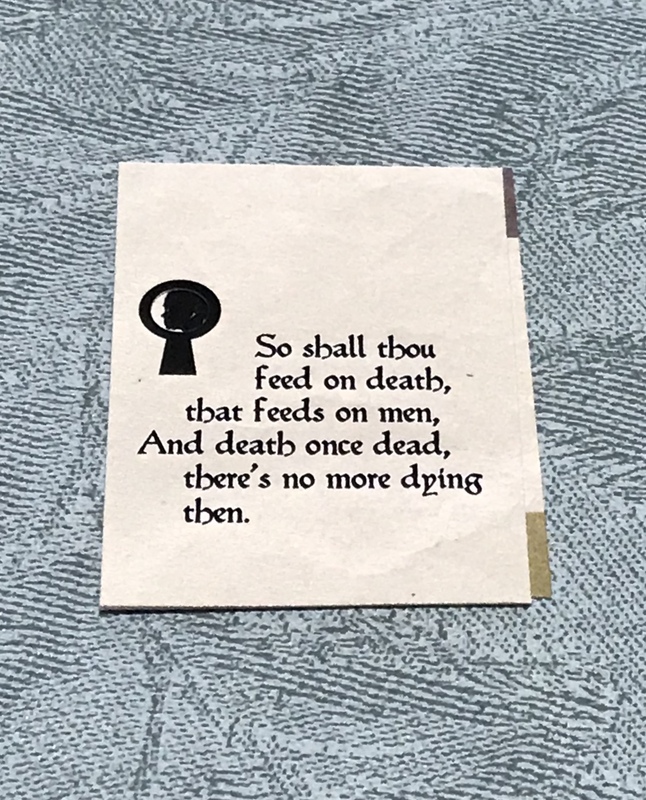 I was off and printing up a low ink version which designer John Kean thoughtfully posted. Dusted off the cutting mat, metal straight edge and rotary cutter. The designer also include a nice booklet on the history of the various ladies in the game. 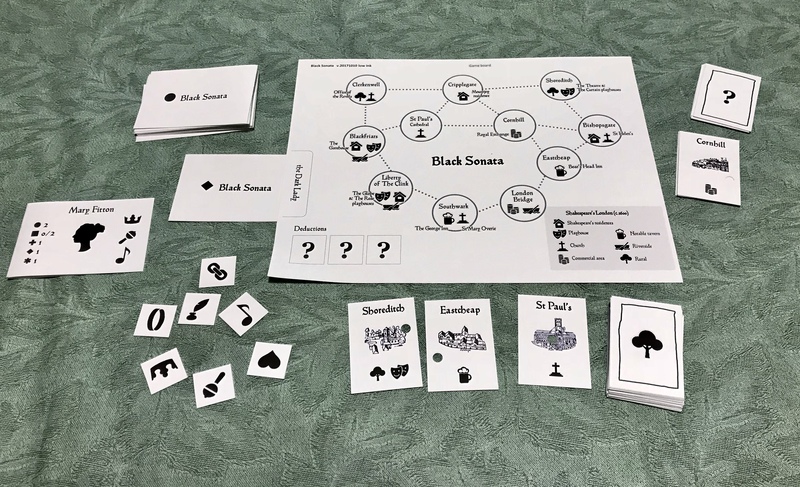 The game consists of a map of London, marked with locations and symbols, clue cards to represent the possible dark ladies, stealth cards, location key cards and “fog” cards. 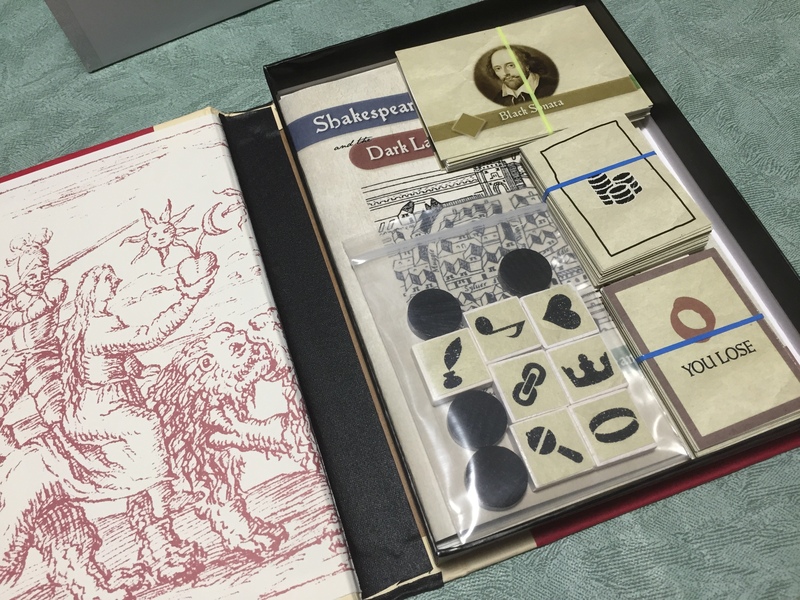 There are also deduction tokens and a pawn to represent player location. The game’s mechanism works well. One of the dark ladies is chosen at random face down and placed under the board. The remaining dark lady cards become a deck of clue cards. The player chooses a starting location. The stealth cards have various symbols on the back which correspond with locations on the board. The front of the cards have letters which help prepare the deck and determine the lady’s path amongst the locations. Some cards have the lady’s silhouette which will be show when the lady’s location is found. The stealth deck is played face down and at the beginning of the turn the top card is placed on the bottom and the lady’s new location is shown. So this part of the game requires finding the lady’s location. If the player’s pawn is in the suspected location of the lady they may search for her. If not, the player may move their pawn to a different location. 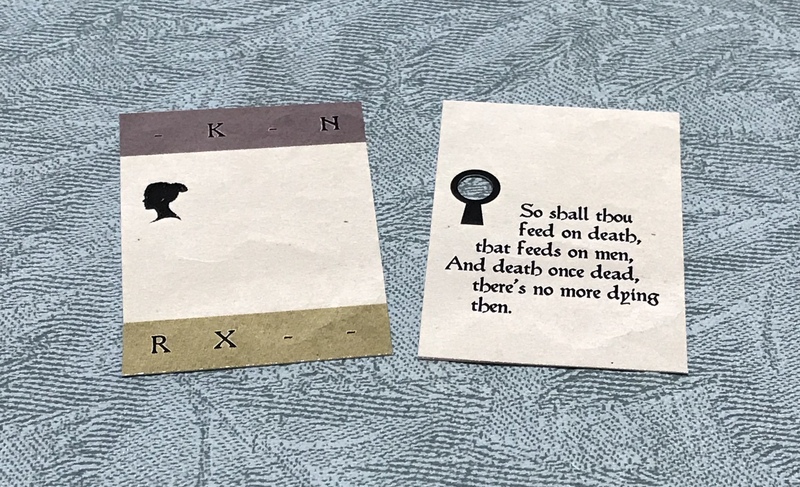 Searching is rather clever, the location key cards have a keyhole (literally a punched card) that the player overlays on the face of the stealth card without looking at it. The stealth card will be replaced by a fog card that have random events which might or might not be helpful to the player when it comes up in the deck later. If the lady’s silhouette is visible the player earns a clue card. Also the stealth deck is then advanced. Stealth cards that were checked for location are removed from the deck. The top clue card is revealed showing on one side 3 of the possible tokens the dark lady may have on her card. The other side has symbols match to the symbol on the back of the card and tell how many of the symbols are correct. This is the second part of deduction in the game. To win, the player must deduce and be in the lady’s location as well as knowing which 3 tokens are represented on the dark lady’s card. The game is lost if incorrect or if the stealth deck is gone through three times. There is a scoring system to challenge oneself based on the number of cards left. I love true deduction games. This game ticks all the right boxes for me, interesting theme and mechanisms. I’m impressed by the clever bits like the locations key cards. The game works very well and it’s challenging enough without feeling like it’s impossible. It’s about the right time length for me. Score is based on number of card left in the stealth deck and fog deck. If you feel it’s too easy or too hard there are some variants. There is good variety and the designer provided some additional pathways if you need. I enjoyed it enough to go for a color version and had fun coming up with a faux book box. 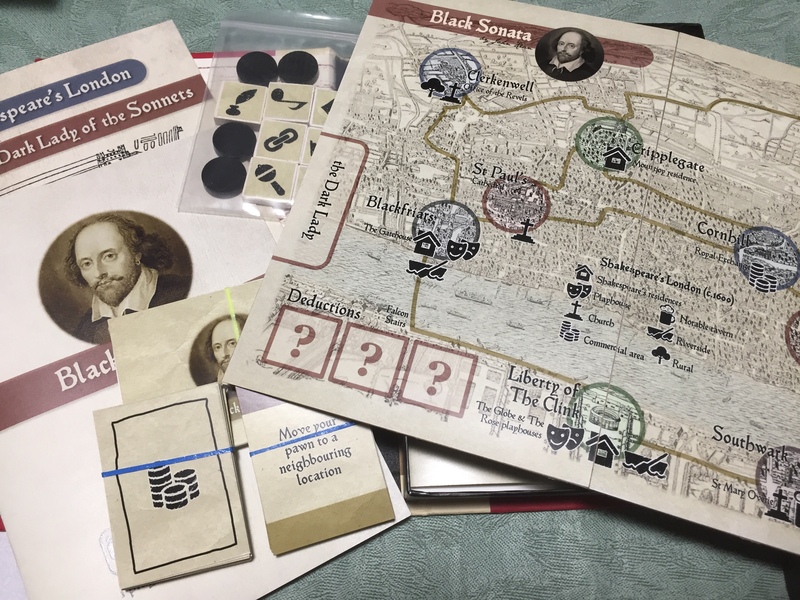 If you are not into print and play but would like this game you are in luck because the designer and publisher announced on BGG that the game will be produced and run as a kickstarter later this year. Great review! We’re really excited to get this one published. It’s just a great game that deserves a bigger audience. Should the board be printed in A4? Looks pretty small?